Today we had this amazing, overcast but super warm and humid day. I was out shopping and once I hit the tarmac, it felt like I stepped into hot jello and transported into the South! I love weather like this because it isn’t’ all that common on the West coast. 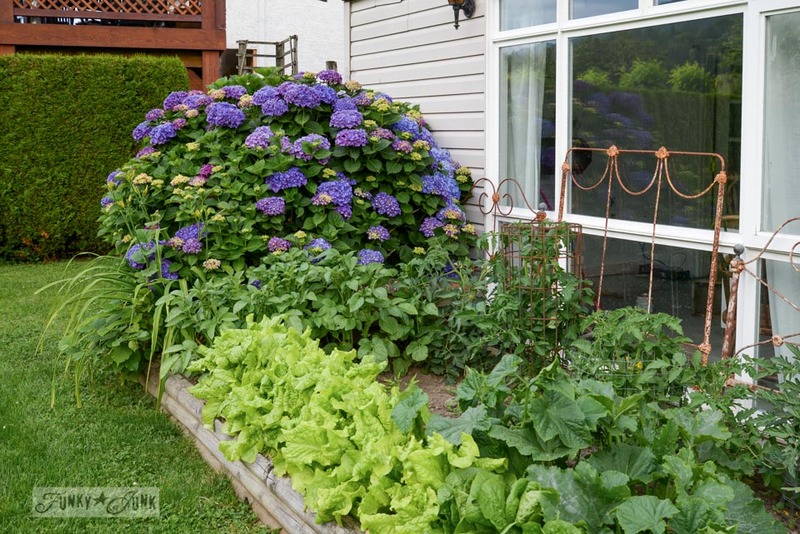 And thank goodness our vegetable garden and purple hydrangea seem to like it too.. in moderation. We really can grow so much here because our temperatures are super mild for the most part. No extremes of either hot nor cold. We plan to go on vacation soon, so I raise my hand and admit, I didn’t do a whole lot to the yard this summer. I guess I still could, but… I dunno. I don’t know that I want to. Because upon first glance, despite that the yard is far from pristine perfect for pictures, I am rather liking how the perennials are doing all the talking this year. With little to no fuss. I like taking my evening coffee outdoors, and just wander the yard. Most of the time I find myself putting the cup down and pulling weeds, but not today. Today I just wanted to appreciate what was there. Naturally. I seriously do think the secret to the most successful gardens are the types that don’t need much added to look like something. 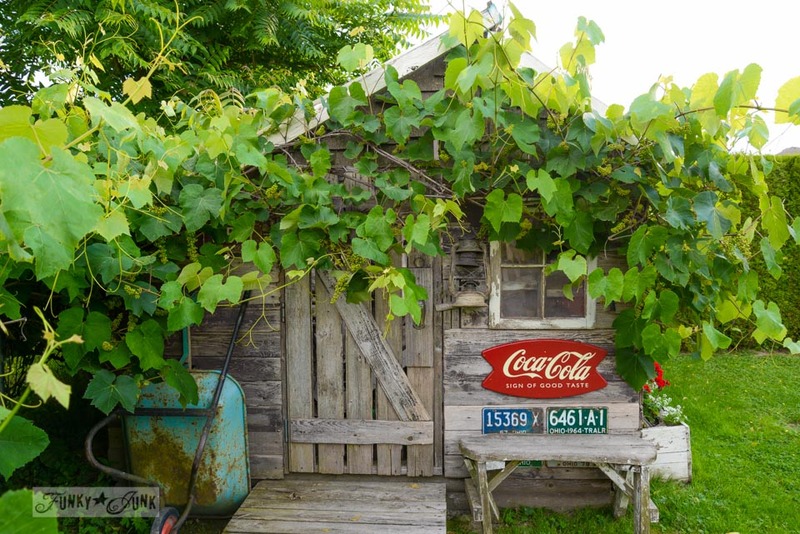 Of course, for those that DO put lots of time into their yards, it most definitely shows. Here’s my back yard when I really fussed over it one year. The flowerbeds were amazing. I love how the grapevine took over all on its own. It offers a ton of privacy, and fills up any empty spots in a jiffy. It’s finally starting to climb the ladder arbor too. Remember this post where I talked about getting a full flowerbed look while doing very little? I mentioned the ‘weeds’ to the right of the galvanized tub, thinking they were flowers. They are HUGE now! And about to bloom. The flowers look like the tiniest of daisies. Which promptly closed when I brought my camera out… of course. I’ll try to get out there with a better lens for closeups when they are blooming one day. I was lazy today. The tripod and fancy lenses stayed in the house. 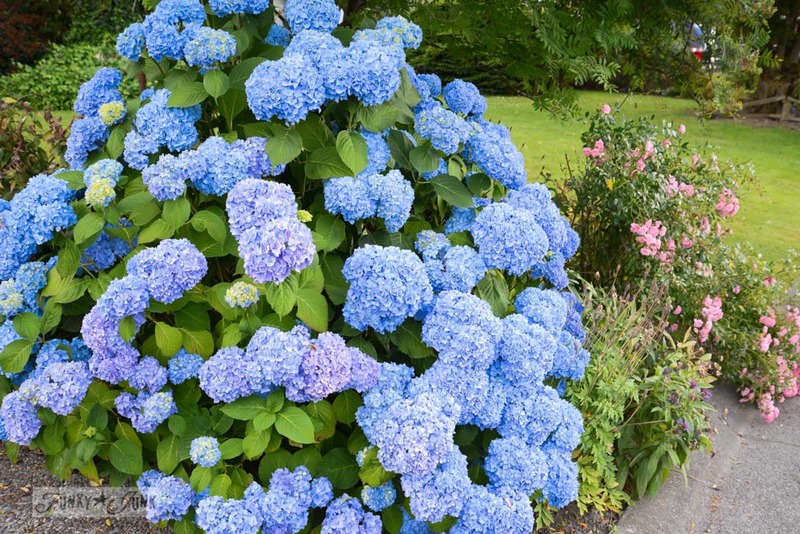 This amazing blue hydrangea by the road gets no attention at all. 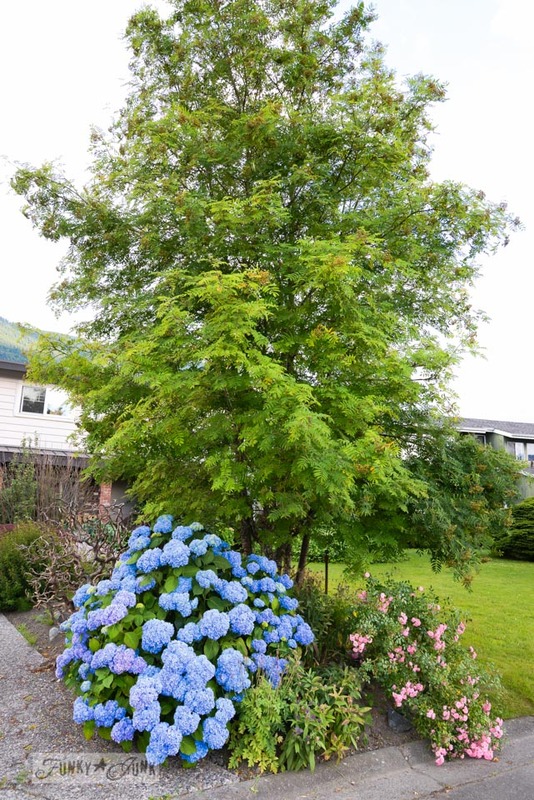 I mean, a light pruning for shape in the fall after the blooms are spent, but that’s it. And look what it does right back. I cannot wait to dry all the hydrangeas this fall! The pink bush to the right are miniature roses. That are absolutely so heavy with blooms they are spilling onto the road. 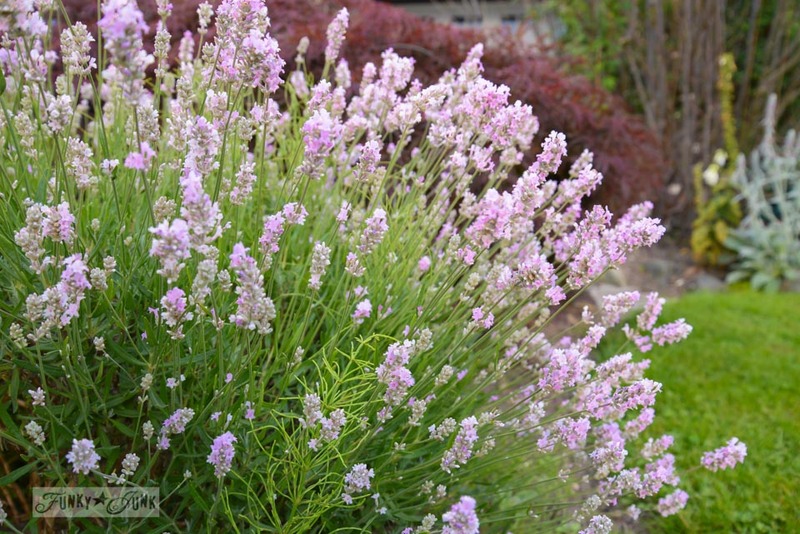 The lavendar looks really pink this year, It’s very pretty and I need to remember to dry some. 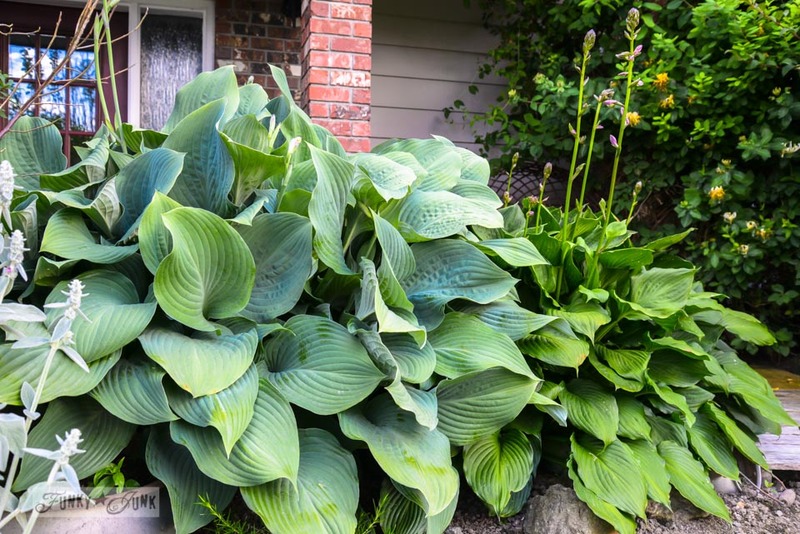 And the good ‘ol reliable hostas never cease to amaze me. They will bloom soon too. I really wish I had time to pamper each and every plant constantly, but… I kinda don’t. I’ve been busy pulling together my key note speech for BlogPodium, submitting some articles for other features, and arranging vacation plans I haven’t blogged about yet. Did you go all out this summer or cut back? I have poked around in the perennial garden, weeded and put down fresh mulch but that is all I have done. No new plants this year. I did start a very small, organic garden but all in containers. 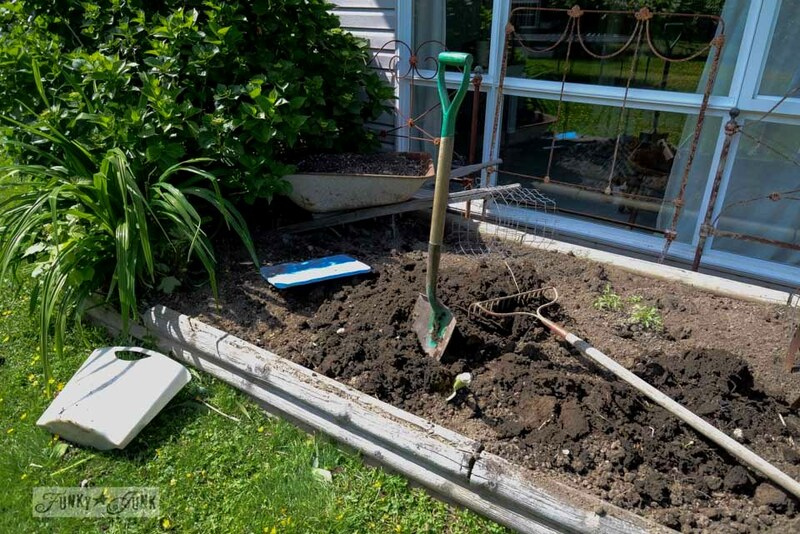 I wanted to do a raised bed but that didn’t work out this year so that will be my plan for next summer. I love the garden until it gets hot and sticky. I only weed on Saturdays very, very early in the morning because I am such a baby about heat. We have had very moderate weather up to this point so I do find myself out there more often and even strung up solar butterfly lights on my forsythia. They look darling when I go out on the patio at night. Beautiful garden ANSI just love your hydrangeas. Mine are straggly. 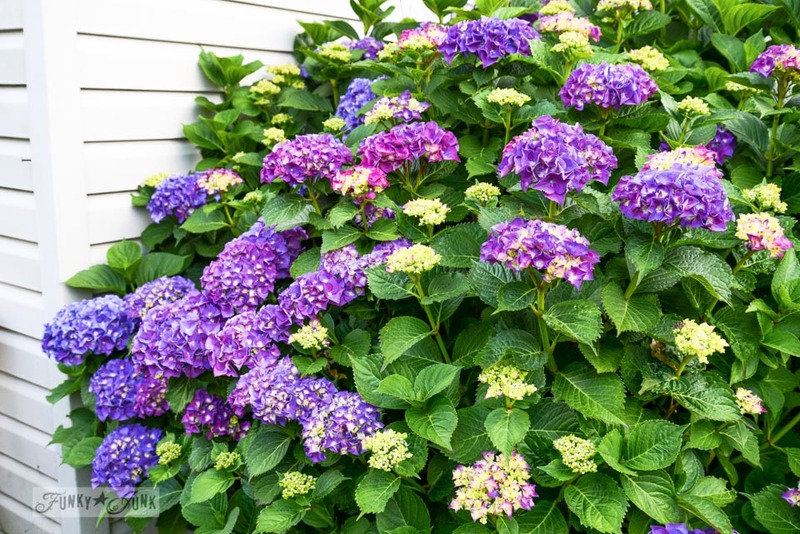 Just wondering how you get your flowers purple on that beautiful hydrangea bush? It’s just stunning. I’ve added lime to a few of my blue Endless Summer Hydrangeas, but they remain blue. Just would like to have some different color than blue once in a while. 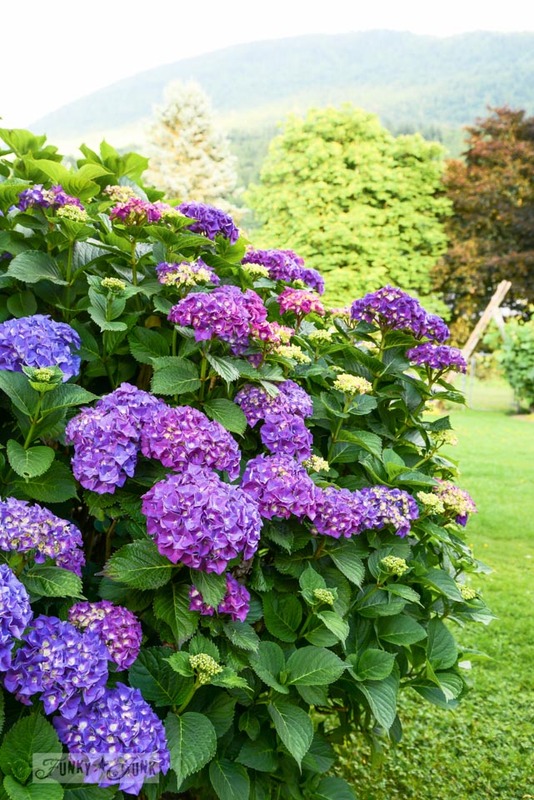 Are your Hydrangea bushes Endless Summer? Donna, your yard is amazing! Loved the tour! I have hydrangeas envy! Beautiful! I wouldn’t have a “flower” garden, if I didn’t have flowering weeds. I let them grow and bloom to see what flower emerges. Love them! Your yard is lovely and indeed what we do without perennials!! I do want to add a Hydrangea to my yard but at the moment hostas, roses, tiger lilies and hibiscus are making it glow!! The Siberian iris have finished their blooming season but I plan to split and move them again this year because they triple their area/size every year. I give them to everyone and am now distributing them on a sunny bank in front of the yard. It’s one thing I have that the chickens seem to stay out of as well as the tiger lilies. Imagine a ground covering of orange and dark purple! I love the way you integrate all of the old items in amongst your beds too! I save broken crocks, old benches, gates, birdhouses and farm tools in mine. Love your blog!! It’s all so lovely Donna! 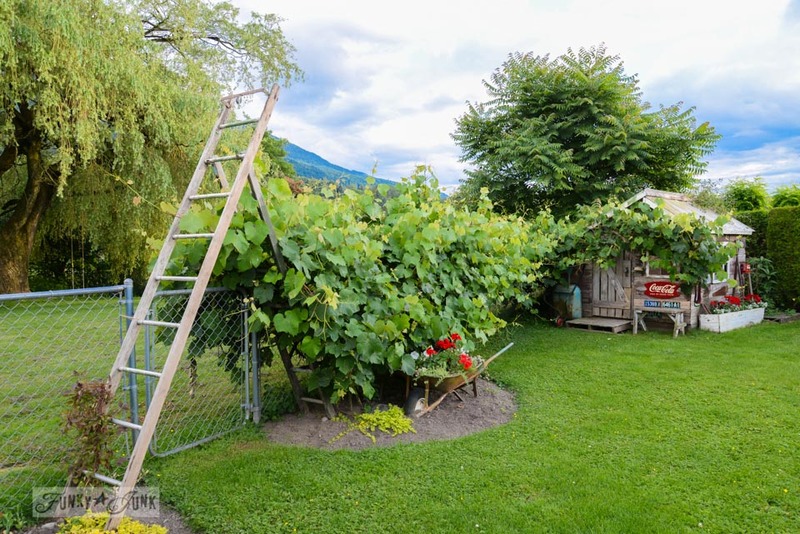 I’d walk that yard every night too 🙂 I sit on my porch on nice evenings and enjoy the few things that we have going for us this year – my urns full of lovely white flowers, my vintage bike with the cute basket full of peppermint and my beloved hydrangea plants that are amazing this year! Loved your comment about putting your coffee down to weed since my middle name is “distraction”. I start one project and before I know it I’m doing something completely different and not getting either project finished. We’ve had tons of rain – not complaining because everything is lush green – here in SD this summer, but the weeds have loved it too and they have overtaken everything. I have cats too so don’t use weed killers and have tried a vinegar mixture with no luck. Would love to find a pet safe weed killer. Any ideas? 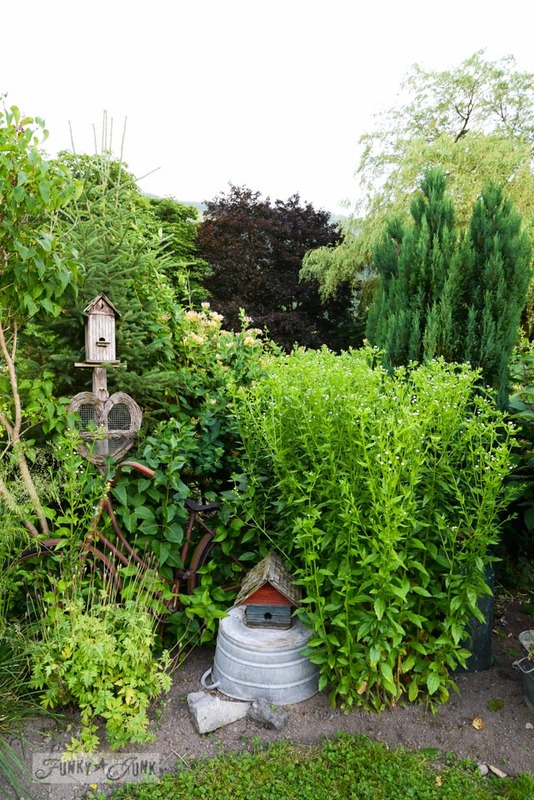 For a self proclaimed non-gardener, your garden is gorgeous! Gotta love that West Coast weather. Hi there! I have a question maybe you can help with. I have two old church windows I would like to sell in southern Canada (Ab). They are great architecural finds with some original amber glass, wood frame is untouched. I got them as salvage from a local church that was being renovated (circa 1940’s) I just do not have a clue where to post them for sale. There isn’t many site to post for these items other than ebay. I wonder if you know of a site? Thank you I really enjoy your photos and creativity. Hi Angela, what about Craig’s List? 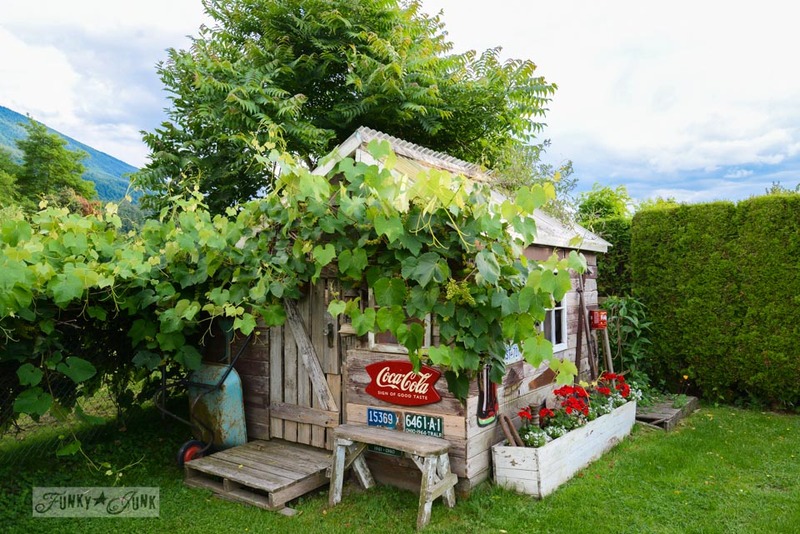 Donna – your yard and gardens are beautiful! The definition of a weed is “any plant you don’t want”. 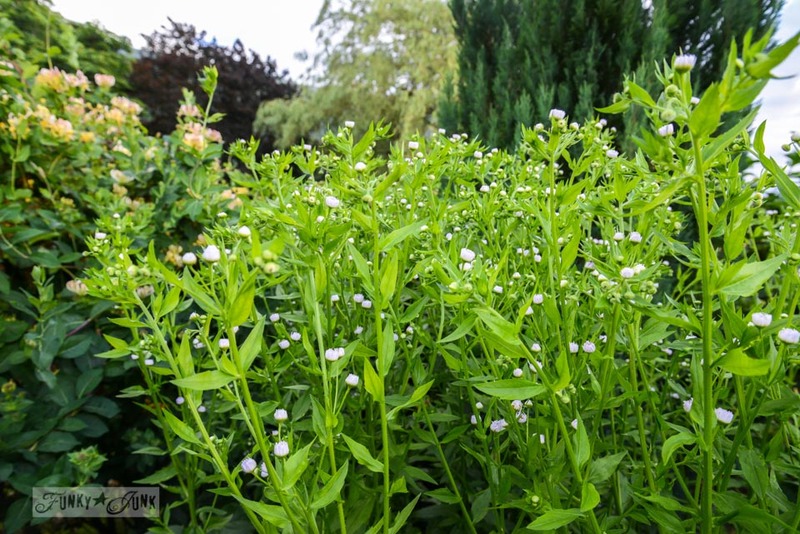 Your weeds are very lovely and they have flowers!! Here in Florida my garden needs lots of watering to keep the plants happy! Looks absolutely gorgeous to me. Not much is going on in my yard for sure. Even my Four O’Clocks are whimpy this year. I do have my huge Lilies in bloom, but they don’t come close to your yard. 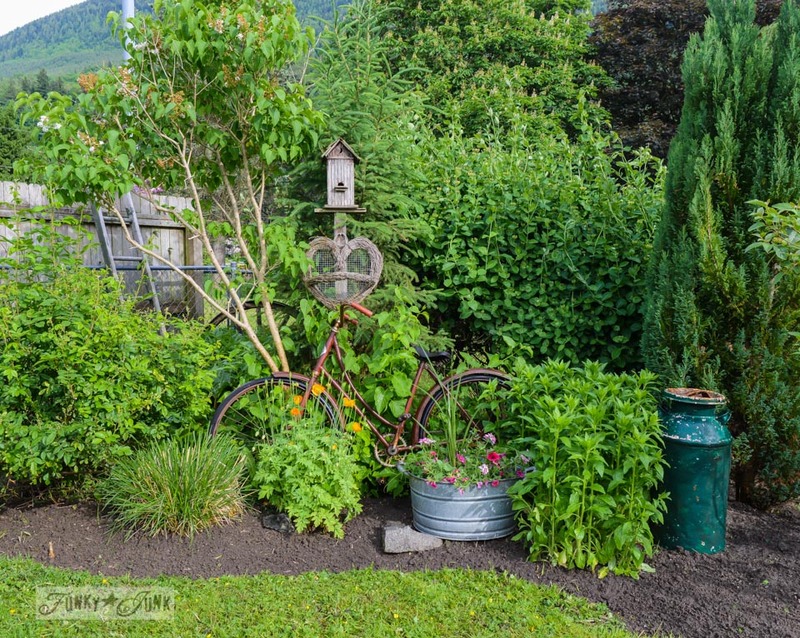 Donna – Your yard and perennials look awesome! I’ve been itching to get into my gardens and move some plants around, but we’ve had so much rain lately that the skeeters are horrible! They look like a flock of black birds on my screen doors. We put mosquito dunks into all the rain barrels and I even have a dunk in the birdbath, but they’re still bad. We need to spray the grass and all shrubs with the mosquito repellent that hooks up to the hose. Maybe this weekend…. Digging these plants for sure!! oh, Oh, OH! Those hydrangea’s are gorgeous!! Due to the drought here I have only a small veggie garden and a few perennials and some bulbs that do not require much water. The water situation here is dire. I would love to be able to grow hydrangeas and hostas, but they are not happy here. I love looking at the pictures of your beautiful yard. It is lovely. Do the kitties ever get to go out there with you? Yes, keeping those wonderful kitties healthy is a grand plan. They are such sweethearts. I just read your post about the “non-productive” day you had, simply enjoying your patio/backyard/coffee. That sounds like a perfect day. Good for you!